Polyvinyl chloride supported silver molybdate composite material is used to develop by solution casting method. This membrane was characterized by various instrumental techniques such as Fourier transform infrared (FTIR) spectroscopy, thermogravimetric analysis (TGA) and scanning electron microscopy (SEM) analyses. These characterizations are used to understand the functional groups,thermal stability, surface morphology, porosity, ion transportation etc. The electrochemical study of membrane showed that the ionic potentials decrease by increasing the concentration of electrolyte solutions while the surface charge density of membrane followed the reverse order. It indicated that the membrane is showing negative charge property. Electrochemical parameters of membrane like surface charge density, transport number, mobility ratio, charge effectiveness etc are determined by TMS and Nernst theoretical equations. T.J Chou, A.Tanioka, Ionic behavior across charged membranes in methanol water solutions. I: Membrane potential, J. Membr. Sci. 144 (1998) 275-284. 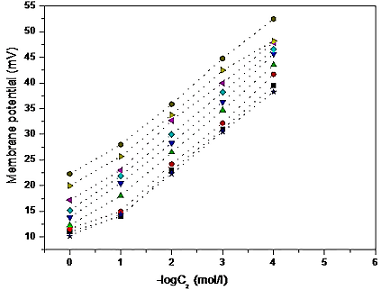 S. Weqar, A. Khan, A. Shakeel, Inamuddin, Synthesis, characterization and ion-exchange properties of a new and novel ‘organic–inorganic’ hybrid cation-exchanger: Poly(methyl methacrylate) Zr(IV) phosphate, Colloid. Surf. 295 (2007) 193-199. R.K Nagarale, V.K Shahi, S.K Thampy, R. Rangarajan, Studies on electrochemical characterization of polycarbonate and polysulfone based heterogeneous cation-exchange membranes Reac. Func. Polym. 61 (2004) 131–138. M.N. Beg, M.A. Matin, Studies with nickel phosphate membranes: evaluation of charge density and test of recently developed theory of membrane potential, J. Membr. Sci. 196 (2002) 95–102. T. Arﬁn, Raﬁuddin, An electrochemical and theoretical comparison of ionic transport through a polystyrene-based cobalt arsenate membrane, Electro. Acta 56 (2011) 7476–7483. Z.A. Al-Othman, Mu. Naushad, Inamuddin, Organic-inorganic type composite cation exchanger poly-o-toluidine Zr(IV) tungstate: Preparation, physicochemical characterization and its analytical application in separation of heavy metals, Chem. Eng. J. 172 (2011) 369-375. M.K Ramir, Rafiuddin, Synthesis, characterization and properties of polystyrene incorporated calcium tungstate membrane and studies of its physicochemical and transport behavior, J. Mol. Struc. 1033 (2013)145–153. T.J Chou, A. Tanioka, Ionic behavior across charged membranes in methanol-water solutions. I: Membrane potential, J. Membr. Sci. 144 (1998) 275-284. G.S Gohil, R.K Nagarale, V.V Binsu, V.K Shahi, Preparation and characterization of monovalent cation selective sulfonated poly (ether ether ketone) and poly (ether sulfone) composite membranes, J. Colloids Interf. Sci. 298 (2006) 845–853. A.A. Moya, Harmonic analysis in ideal ion-exchange membrane systems, Electro. Acta 90 (2013) 1–11. M.M.A Khan, Rafiuddin, Synthesis, electrochemical characterization, antibacterial study and evaluation of fixed charge density of polystyrene based calcium-strontium phosphate composite membrane, Desalination 284 (2012) 200-206. Z.A Al-Othman, Mu. Naushad, Determination of ion-exchange kinetic parameters for the poly-o-methoxyaniline Zr (IV) molybdate composite cation-exchanger. Chem. Eng. J. 166 (2011) 639-645. M.M.A. Khan, Rafiuddin, Preparation, electrochemical characterization and antibacterial study of polystyrene-based magnesium–strontium phosphate composite membrane, Mater. Sci. Eng. C 32 (2012)1210–1217. Z.A. Al-Othman, Inamuddin, Mu. Naushad, Recent developments in synthesis, characterization and applications of zirconium(IV) based composite ion exchangers -A review, J. Inorg. Organomet. Polym, 23 (2013) 257-269. N. Hilal, H. Al-Zoubi, N.A. Darwish, A.W. Mohamma, M. Abu Arabi, A comprehensive review of nanofiltration membranes: treatment, pretreatment, modeling, and atomic force microscopy, Desalination 170 (2004) 281-308. G.S. Gohil, V.V. Binsu, V.K. Shahi, Preparation and characterization of mono-valent ion selective polypyrrole composite ion-exchange membranes. J. Membr. Sci. 280 (2006) 210-218. R.K. Nagarale, V.K. Shahi, R. Schubert, R. Rangarajan, R. Mehnert, Development of urethane acrylate composite ion-exchange membranes and their electrochemical characterization. J. Colloids Interf. Sci. 270 (2004) 446-454. M. Zarrinkhameh, A. Zendehnam, S.M. Hosseini, Electrochemical, morphological and antibacterial characterization of PVC based cation exchange membrane modified by zinc oxide nanoparticles. J. Polym. Res. 20 (2013) 1-9. A. Zendehnam, M. Arabzadegan, S.M. Hosseini, N. Robatmili, S.S. Madaeni, Fabrication and modification of polyvinylchloride based heterogeneous cation exchange membranes by simultaneously using Fe-Ni oxide nanoparticles and Ag nanolayer: Physico-chemical and antibacterial characteristics. Korean J. Chem. Eng. 30 (2013) 1265-1271. M. Arsalan, MMA, Khan, Rafiuddin, A comparative study of theoretical, electrochemical and ionic transport through PVC based Cu3 (PO4)2 and polystyrene supported Ni3 (PO4)2 composite ion exchange porous membranes, Desalination 318 (2013) 97–106. M.M.A. Khan and Rafiuddin, Synthesis, characterization and antibacterial activity of polystyrene based Mg3(PO4)2/Ca3(PO4)2 composite membrane, Desalination 294 (2012) 74–81. M.M.A. Khan, Rafiuddin, Inamuddin, Synthesis, characterization, thermal behaviour and transport properties of polyvinyl chloride based zirconium phosphate composite membrane, J. Environ. Chem. Eng. 2 (2014) 471–476. A.M. Hollman, N.T. Scherrer, A.C. Goodwin, D. Bhattacharyya, Separation of dilute electrolytes in poly(amino acid) functionalized microporous membranes: model evaluation and experimental results, J. Membr. Sci. 239 (2004) 65–79. ASTM D543-95, Standard particles for evaluating the resistance of plastics to chemical reagents, 1998. M.M.A. Khan, Rafiuddin, Synthesis, characterization and electrochemical study of calcium phosphate ion exchange membrane, Desalination, 272 (2011) 306–312. M.N. Beg, F.A. Siddiqi, R. Shyam, I. Altaf, Studies with inorganic precipitate membranes: Part XXVI.Evaluation of membrane selectivity from electric potential and conductivity measurements, J. Electroanal. Chem. 98 (1978) 231-240. Mu. Naushad, Inamuddin, T.A. Rangreez, Z.A. ALOthman, A mercury ion selective electrode based on poly-o-toluidine Zr(IV) tungstate composite membrane, J. Electroanal. Chem. 713 (2014) 125-130. X. Zhang, X. Shiyou, H. Gaorong, Fabrication and photo catalytic activity of TiO2 nanofiber membrane, Mat. Lett. 63 (2009) 1761–1763. Z.A Siddiqi, M. Khalid, S. Kumar, M. Shahid, S. Noor, Antimicrobial and SOD activities of novel transition metal complexes of pyridine-2,6-dicarboxylic acid containing 4-picoline as auxiliary ligand, E. J. Med. Chem. 45 (2010) 264-9. R. Niwas, A.A Khan, K.G. Varshney, Synthesis and ion exchange behaviour of polyaniline Sn(IV) arsenophosphate: a polymeric inorganic ion exchanger, Coll. Surf. A 150 (1999) 7–14. A.A. Khan, Inamuddin, M.M. Alam, Determination and separation of Pb2+ from aqueous solutions using a fibrous type organic-inorganic hybrid cation-exchange material: polypyrrole thorium(IV) phosphate, React. Func. Polym. 63 (2005) 119–133. 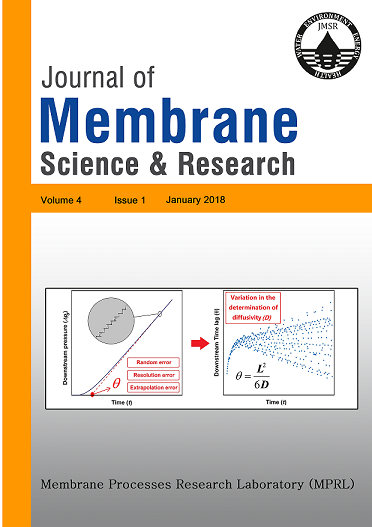 T.J. Chou, A. Tanioka, Membrane potential of composite bipolar membrane in ethanol–water solutions- the role of the membrane interface, J. Colloids Interf. Sci. 212 (1999) 293-300. M.A. Ansari, M. Kumar, N. Singh, K.S. Dadoriya, R.S. Kushwaha, S. Ayub, Ion transport studies through polystyrene based model membrane: Conductance data and absolute reaction rate theory, Adv. Appl. Sci. Res. 3 (2012) 251-260. H. Haibo, G. Bin, C. Feng, Effect of membrane surface characterization on salt and water transport through aromatic polyamide membranes, Adv. Sci. Lett. 12 (2012) 218-222. A. Kruissink, Bergsma, Ion-exchange membranes, Adv. Polym. Sci. 2/1 (1960) 307-362. F. Jabeen, Rafiuddin, Transport studies with composite membrane by sol-gel method, J. Disp. Sci. Technol. 31 (2010) 1708–1713.